If you’re planning ahead for some bicycling opportunities for entire family in the Seattle area, remember to mark down the dozen dates for Bicycle Sundays this spring and summer. Beginning in 1965, the city of Seattle set aside several Sundays every summer when a scenic section of Lake Washington Boulevard is closed to vehicular traffic. It’s always sunny in Seattle on Bicycle Sundays. Or at least that’s how I remember my regular rides over to Lake Washington Boulevard to enjoy some scenic bicycling without the worry of motor vehicle traffic. The string of a dozen Bicycle Sundays in 2012 ended on a glorious sunny fall day in Seattle. A steady stream of bicyclists — everyone from the hard-core cyclists to biking tots with their families — showed up on Lake Washington Boulevard on Sunday to ride without having to worry about cars. That’s because motor vehicles were banned for the day between Seward Park and Mount Baker Beach. 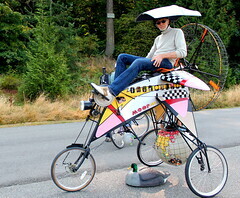 What really struck me, however, was the appearance of the MOOP Jet, a fanciful trike that might seem more at home at Burning Man, where it has made a couple of landings.